Month 2 is over for the Monkey Stocks League Challenge so who’s riding high in the charts? Below is a snapshot as at the close of trading 30th November 2015 and currently in the lead is….my Funky Monkey Fund! Actually, I’d rather not be in the lead as there will be the inevitable cries of ‘fix’ but I can assure you that my stocks were picked totally at random in front of numerous witnesses at the FIRE Escape gathering in York! Anyway, for the Live table (during trading hours, Rank and Value will be updated automatically) and full portfolio listings, have a look here and also via the right sidebar. All November dividends have been added to the respective portfolios. However, please let me know if I’ve missed any (or if there are any errors) – it’s not easy keeping on top of them all! The highest jumper from the last update seems to be Craig’s Interesting Initials Fund, which was in 17th place, now in 4th. 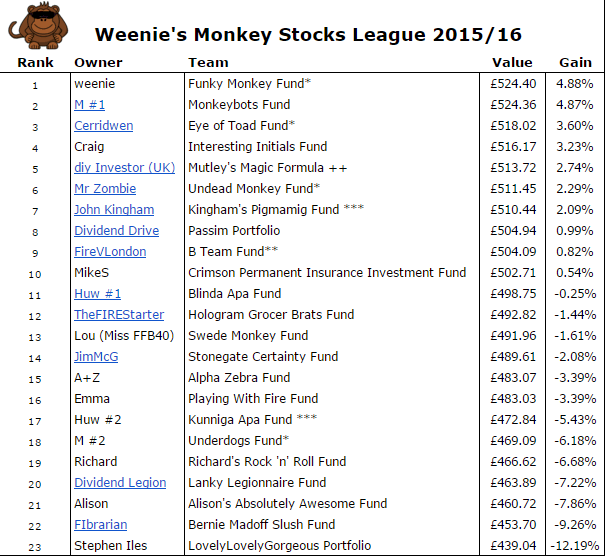 Other big movers include FireVLondon’s B Team Fund, which was in 18th place and Mr Z’s Undead Monkey fund, both now back in the top 10. In fact, all of the real portfolios are in the top 10 apart from M’s Underdogs Fund, which was one of the big fallers, along with Huw’s hand-picked fund, Kunniga Apa. Both appear to have been dragged down by Standard Chartered and also the mining companies, Glencore and BHP Billiton respectively. The other hand-picked fund, Kingham’s Pigmamig Fund is steady in 7th place. The best performing share since the start of this league is Coca-Cola HBC AG, which has seen a 22.05% gain, followed by NMC Health plc which has seen an 18.86% gain. The two worst performing are BBA Aviation, which is on a loss of 36.57%, followed by Poundland Group on a loss of 35.98%. Another interesting month of seeing some portfolios jump up and down the table whereas others haven’t succumbed as much to volatility. This entry was posted in Blindfolded Monkey, Dividend Investing, Monkey by weenie. Bookmark the permalink. Nice summary Weenie. I know someone who's just taken on a Board level role at Poundland. Careers are built on timing, as they say…. Haha, indeed! Sometimes, you catch the Google updates and positions just change before your eyes – I'm not sure I'd be able to cope if I had a huge amount of money riding on this! Thanks Jim. Perhaps with Poundland at rock bottom, the only way is up! Haha, only joking. Go Funky Monkey Fund! Haha, thanks. Looking at the table today, we've slipped into 4th place!